Don’t understand how color temperature and lumens affect your home’s lighting? Don’t worry — we’ll show you what’s watt and how it can save you money. How can I lower my electric bill with more efficient lighting? There’s more to do than switching lights off to lower your electric bill and save on lighting costs. The average household spends about 5% of energy costs on lighting; that’s over 500kWh for energy consumers in Cleveland, Ohio. To cut your energy bill, you want to find the best lighting option for your home, which may mean switching to a different kind of lightbulb. What are my lighting options for cheap electricity in Cleveland? Incandescent: these traditional lightbulbs lacked efficiency and are no longer produced. A whopping 95% of energy with this bulb was given off as heat rather than light. That means even with a cheap electric rate, the product wasted money. Halogen: the updated version of traditional incandescent, these bulbs hold gas around the light filament to increase efficiency. The bulbs meet federal energy efficiency standards, but aren’t setting any records for Ohio green energy. CFLs: compact fluorescent lamps are the same as the long tubes you see in warehouses and basements, but in a curly lightbulb form. Though more expensive, they use about a fourth of the energy and last ten times as long as incandescent bulbs. With the energy savings, these bulbs pay for themselves in about nine months. LEDs: light emitting diodes are used in a variety of ways including replacing traditional lightbulbs. They use about 25% of the energy of halogen bulbs and could last 25 times longer! They are more expensive but save money long-term with efficiency and longevity. What else do I need to know about lighting options? Before you switch to a new energy-saving bulb, learn about light color and temperature so you can choose the best electric components for your Cleveland home. Measured in Kelvin units, temperature indicates light color on a spectrum from yellow to blue, yellow being the lowest temperature and blue the highest. Lightbulbs are marked with color and temperature to help you shop and compare: 2200 Kelvin-3000K is soft white; 3500K-4100K is cool white; and 5000K-6500K is daylight. Incandescent bulbs are always soft white, but energy efficient bulbs are available in a range for different applications. Soft white is traditional, cozy, and good for bedrooms or living rooms. Cool white is great for kitchens and bathrooms. Daylight is ideal for bathrooms and illuminating details in a workshop, craft room, or reading light. Take note that although light appears brighter with higher light temperatures, the lumens, or the amount of light produced, is actually the same. What are other ways to save on my electric bill? After you determine the best lighting option for you home, you can increase your energy savings even more with light timers and sensors to make sure lights are off when not in use. 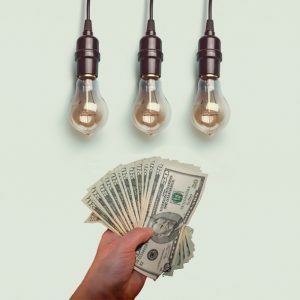 If you’re ready to go beyond lighting in the search for cheap electricity, you’ll find more money-saving opportunities at Ohio Energy Ratings. When you compare electric rates apples-to-apples at Ohio Energy Ratings, you’ll find the best electric provider and save money. Start comparing cheap rates in Cleveland today at: https://www.ohenergyratings.com/electricity-rates. How Big Is Ohio Solar?